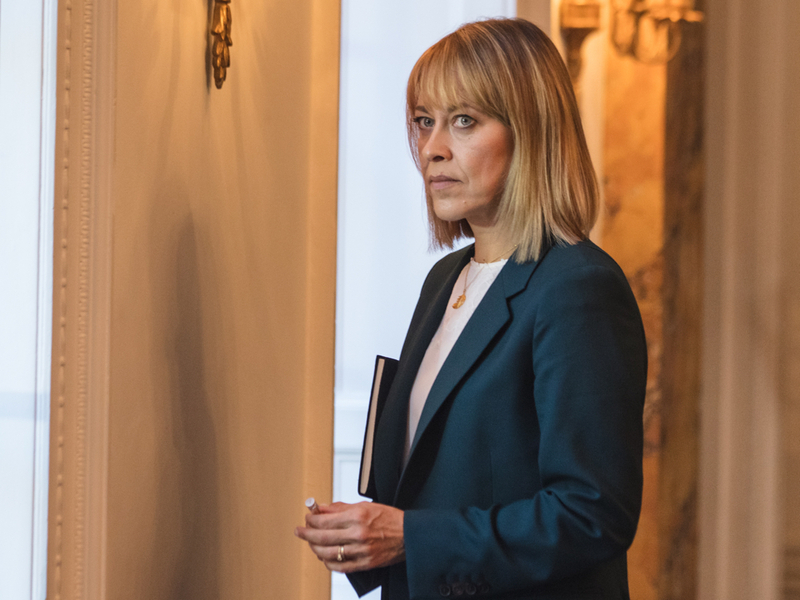 If you’ve watched a British-made TV series recently (or ever), you’re most likely familiar with Nicola Walker. She played a detective in Unforgotten on PBS and a vicar in Collateral, now streaming on Netflix. She’s currently leading a marvelous cast in The Split on SundanceTV. Walker plays Hannah Stern, a high-powered divorce lawyer and the eldest daughter of a family of lawyers. She recently left the family firm created by her mother Ruth (Deborah Findlay), for a larger London firm. Her former flame, Christie (Barry Atsma), also happens to work there. Christie is just another complication in Hannah’s life. She’s mom to three kids, but also seems to be taking care of husband Nathan (Stephen Mangan) and her sisters, Nina (Annabel Scholey) and Rose (Fiona Button). She’s holding it all together—barely—when her father, Oscar (Anthony Head), shows up outside her new offices one day 30 years after abandoning the family. We talked about Hannah’s really bad day, how wonderful it is to work on a project about women created by women, and what Walker almost told Kenneth Branagh. New episodes of the six-part “The Split” air at 9 p.m. Wednesdays on SundanceTV. If you miss an episode, watch at sundancetv.com. You did, you did. To notice that, I’m surprised. Normally it’s only my blood relatives who know about that. You have to be related to me to make that connection. It makes me want to go back and watch that again. Please do. What you’ll enjoy is how absolutely thrilled I look to be there. Mainly I’m just thrilled to be employed. I can’t believe my luck. I’ve got this ridiculous grin permanently on my face. I can’t believe I’m with Kristen Scott Thomas and Andie McDowell. I cannot believe my luck. I love going back and seeing what people who I recognize now have done in the past. That was literally my first job. My secret joy about that job is my character’s wearing a love heart necklace that I stole at the end of my few days on it. When I was being that character, for my own amusement, I put inside the locket on one side a picture of Emma Thompson. The other side I put a picture of Kenneth Branagh. It really tickled me at the time, to have, as far as I was concerned and quite rightly, the king and queen of British theater in my love heart. At some point, they needed to have Hannah the lawyer in their lives. [Laughs.] I worked with Kenneth Branagh years later. I was going to tell him he was in my locket but I chickened out. Probably wise. Let’s talk about “The Split.” Why this role for you? Well, when the audition came in I was sent two scripts, which is unusual. They don’t often give that much away. I read the first two episodes, and that was why really. It’s the first time I’d read a script where up front and center were these four brilliantly written women. Yes, it’s set in a divorce world, but what [creator] Abi Morgan is doing is looking at all modern relationships through the business of divorce. What became very clear to me quickly is what she’s actually writing about is marriage and love and family. That immediately made me very much want to do it. The three sisters and their mother really represent the various stages in life, right? The one sister’s about to get married. One’s husband walked out. The one who is happily married, but may not be as happily married as everybody thinks on the outside. The one sister who’s rejected it all. A mother who actually was left young, but never remarried. [She] concentrated on bringing up those three girls on her own and building this business to pass on to them, which she then refuses to pass on now. Do you normally have to audition these days? I like auditioning. I think I’m one of the few actors who really likes auditioning. Yeah, I still have to sit sweating in a room, acting with a casting director down the lens of the camera. Yes, I’m still doing that. At least when you audition, everyone has a fighting chance of knowing where you’re all going, so I quite like it. You’ve worked with Abi on “River,” and sometimes I think when you work with people again, that maybe that was a little boost that helped or that she thought of you when she wrote, or anything like that, but apparently not. When I went in for the audition, Abi was there. I had such a fantastic time on “River.” All I wanted to do was work with Abi Morgan again. I think she’s an astonishing writer. It became clear very quickly that having Abi in the room was making me incredibly nervous. In my head I was just thinking, “I could completely let her down here. This moment, this is where I could blow it.” Because I respect and love her so much. It was much better when she said to me before I’d auditioned; she was just talking to me a bit about the show. She said, “I’m going to go now.” It was good that she left the room, because I wanted to get it so right for her in the room, that I think if she’d have stayed in the room, I’d have probably got it completely wrong. It was good that she left us to it. Was it important to you, the idea that the show is mainly about women. They’re at the forefront, and also it’s led by women? It’s always important to me that the stories give women time, give the characters time, and are interested in their characters fully. That’s always the most interesting thing about scripts, and they’re the best scripts, where it’s true for the female characters, as much as it is for the male characters. I think that is what Abi does. It was unusual for me to read a script that was clearly putting four women at the front, in an environment that I didn’t realize is heavily, heavily dominated by women. Abi has found a world where women do dominate, divorce law. I didn’t realize that. I knew that London is cited as the divorce capital of the world, for people to come and have their divorces. I had no idea that it was a heavily dominated female area of law. That was new to me. It made sense why Abi thought about that world and thought this would be a great environment in which to talk about relationships of all kinds. I think it’s unusual, too, to see sort of a woman’s midlife crisis. It’s interesting. I hadn’t ever thought of it like that. Someone said that to me the other day. She doesn’t know she’s in crisis. The top of the water is up under her nose. Anything more going into the water just brings it up over her head. She doesn’t know that until it starts happening. She thinks she’s at a point in her life where she’s finally finding an identity outside of her family, and is, I think, quite hopeful about it. Then her father appears outside her new office. Suddenly everything starts to change. I think it’s only then she realizes, it makes her reflect on all her relationships—with her mother, with her father, with her sisters, with her husband. It makes her rethink the stories that she’s told about her family life since he left. That first episode, she really gets everything thrown at her right and left. She’s left the family practice with her mother and her sisters. She gets her new hair and everybody’s commenting on that. Yeah, which is awful for her! Chat with the old boyfriend and then dad shows up. You find out quite quickly in the series, she knew Kristy was going to be there. That’s not a surprise, but is a complication. I think that in Hannah’s mind, the most important thing is that she moves away from that family firm. Everything else that happens that day is on the back of the father walking back into her life out of nowhere, after 30 years. That’s really the thing that knocks her for a loop. I think so. It’s pretty much chucking a grenade into that family in that moment. It seems so real, her reaction as the oldest child, and the one who maybe feels most betrayed. I think she feels she’s carrying all the secrets of the family. She was the one that picked her mom up. You find out later that she was the one that picked her mom up and made sure she got dressed, in the early days after her father left. She made sure her siblings were OK and where they were meant to be. She grew up really fast. I think that’s really common when divorce occurs in a family with siblings. That stamped on her this very clear identity from very young. If there is a crisis, I think it’s less midlife and more about, with the father reappearing, it makes her have to go back and live through that time again. They had found a way to survive and function in a very high manner in his absence. They killed him off. She says to him at one point, “My father’s dead.” That’s what she did. For her especially, she has managed to kill him off. I think that’s why she got married so young. I think that’s why she had her three children and tried to create an environment that she felt was taken away from her very young. She keeps sort of stamping out that little flicker of a flame with Christie but he keeps trying. It gets so complicated. It gets really complicated, about where that flame is flickering from, it gets very complicated as the series goes on. I don’t want to plot spoil it. It’s far more complicated than it first appears. In the first episode, it’s this beautiful man that she knew when they were at law school. There’s quite a lot more going on. You are married. Say that you had planned on getting married later this year, would having done “The Split” have changed your mind? No, not at all. I think marriage is still the most blindly optimistic leap of faith that any couple can make. I think if you get to the place where you feel you want to make that commitment, I don’t think anything could put you off. By the way, why do we keep doing it? We do keep doing it, even though modern love tells us that it’s a very old fashioned contract. We all live, first of all, longer than we used to. Women have many more opportunities in their lives than days gone past. There are a lot of complicating factors, and yet we still make that commitment. I think that I find that incredibly interesting. It cheers me that people still are hopeful in that way. I didn’t ever really want to do anything else. I liked pretending to be other people. When I was 13, when my friends were starting whatever they were into, I found out by my local youth theater and I went there. There was this very mixed group of kids from the area, all from different backgrounds, and they all liked acting as well. I liked making something in a group, created something together. That’s still the bit that I enjoy the most. You’re in a group. Together you build a story together. Nothing much has changed really. We’re currently enjoying you in “Unforgotten” now, too. Will we see more of that?